Written by Dylan on July 7, 2018 in Drama, horror, supernatural. In his feature length directorial debut, Ari Aster has already made a name for himself with the blood-chilling horror film, Hereditary. Boasting an impressive 89% Fresh on Rotten Tomatoes, Hereditary has audiences filling the seats to get a taste of exactly what this unique horror film has to offer. Hereditary begins with the Graham family mourning the loss of their grandmother Ellen. Annie, Ellen’s daughter gives a eulogy on her and her mother’s strained relationship as her husband, Steve, and two kids, Peter and Charlie, watch on. After the funeral, Annie consoles Charlie, her teenage daughter and school outcast. 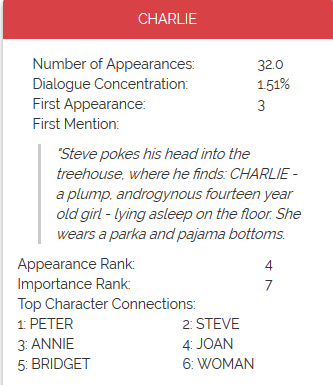 Charlie, is soft spoken only offering 1.51% of the film’s total dialogue (Fig 1) and it’s clear from the start that there’s something off about her. Charlie spends her time crafting odd figures from random objects she finds laying around, even going as far as to cutting the head off a dead bird for one of her crude handmade toys. Hereditary doesn’t shy away from the tension, which is likely why 83.2% of the scenes are internal, providing us with a feeling of being trapped alongside the Graham family as they navigate the horrors within their house (Fig 3). By focusing on internal locations, specifically the Graham house, not only can a filmmaker maintain a consistent tone, but they can also save money without having to shoot at multiple locations. The external scenes are mostly used as establishing shots with only a handful of plot focused scenes taking place outside. Either way, the external scenes are only sprinkled throughout this internal focused film (Fig 4.). In a film where family drama takes the stage, Hereditary has a standard trend in its delegation of action and dialogue. With 66.3% action and 33.7% dialogue (Fig 5) it is the times when our characters are being psychologically haunted by the literal ghosts of their pasts where we get our hair-raising fix. The dialogue between the family or Annie and Joan is what drives the plot towards our dialogue free montages. In the action/dialogue by scene breakdown, we can see four large chunks where dialogue is either minimal or non-existent (Fig 6). These tension filled montages make our heart race as we anticipate whatever is going to jump at us next. Though Annie isn’t the only character who drives the plot forward. Each of the main cast has their own share of significant roles to play. In Hereditary’s 4 most significant scene ranges, each of the family members and Joan get to push the plot forward. The most significant, scenes 79-84 depict Annie arriving at Joan’s house where Joan introduces her to the ritual that brings Charlie back. Scenes 32-40, the second most significant, show Peter and Charlie at the party just before her untimely death. At third, scenes 11-15 are where the bird flies into Charlie’s classroom window and she snips its head off for her homemade toys. And finally, scenes 143-147 have Annie revealing the truth about Joan to Steve and proceeding to burn Charlie’s notebook in the fireplace which causes Steve to erupt into flames (Fig 10). With a budget of only $10 million and standing at $57 million at the box office so far, Hereditary is exceeding its estimated projections and making it A24’s big opening title so far. This is even more impressive when you account for Hereditary competing with box office giants like Solo: A Star Wars Story and Deadpool 2. If you have a cleverly written script that allows you to save your budget by minimizing your shooting locations, a box office success just might be in your future. Richard Linklater’s Boyhood, which was both filmed and takes place between 2002 and 2014, chronicles the life of Mason Evans Jr. from ages 6 to 18 as he grows up in Texas alongside his sister, mother, her three romantic partners throughout the years, their children, and, occasionally, his dad.